Isn’t fall the best? The crispness in the air, the crunch of the leaves underfoot and all the warm colors make me want to snuggle up with my kiddos by a warm fire and drink mulled wine. I guess that is considered more of a holiday thing, but I’ve never been one to stick to traditions. As much as I love fall, I’m not one to go too crazy with seasonal decor but I do appreciate warmer colors, yummy textures and neutral tones in the colder months. Truth be told, I’m just a bit lazy when it comes to seasonal decor, but there is nothing easier than going outside and clipping a branch off of a tree with some fall color. Pair that with some warm and muted decor, cozy texture and call it a day! 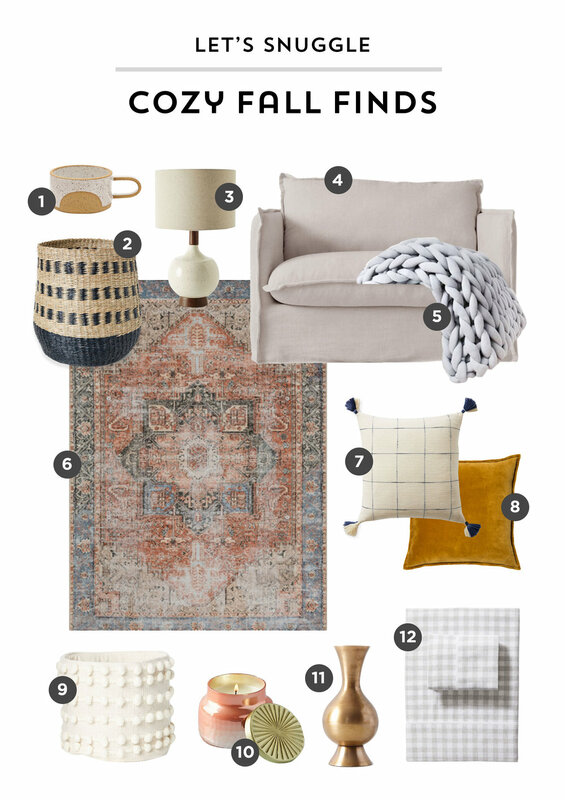 I’ve rounded up some of my favorite cozy fall finds below. Cuddle up and enjoy! 1. Those amazing handmade ceramic mugs would be perfect for a nice cup of hot coffee, tea or even dare I say…some of that mulled wine! I’ve been a fan of that speckled ceramic look for a while now and I love the color! 2. Baskets are wonderful for storage and adding texture. I love this one from H&M and its a decent size for $25! 4. I really, really want this chair for our family room! Its the definition of cozy! 5. I LOVE my braided throw from Ohhio! Its cozy and so, so beautiful. Perfect for snuggling up! 6. This rug is in my shopping cart! The colors (and price) are amazing! 7. Serena & Lily is one of my all-time favorite places to shop and I love this classic windowpane patterned pillow from their new collection! 8. This golden velvet pillow is so pretty! 9. Another really cute and affordable storage bin from H&M. Love the texture! 10. This candle is my all-time favorite! I’ve been buying it for YEARS. The scent (Aloha Orchard) is happy and warm and feels like home to me. 11. I love this vintage-inspired brass bud vase! 12. Another Serena & Lily find – flannel sheets for ultimate comfy and cozy snoozing.